In this tutorial we integrate Google maps, geolocation and places, three of the most important features when we talk about location based apps, into one functional and easy to understand example so you can master the concepts behind location based apps. Learn everything about maps in ionic here! An Ionic App where you will integrate these features. 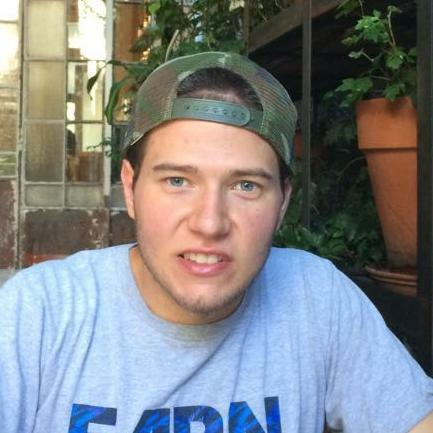 You can either use a blank app, or an existing one. If you don’t want to start from the scratch you should check these ready-made starters that will save you weeks of design and development. Note: This post is for Ionic 3 or 3. 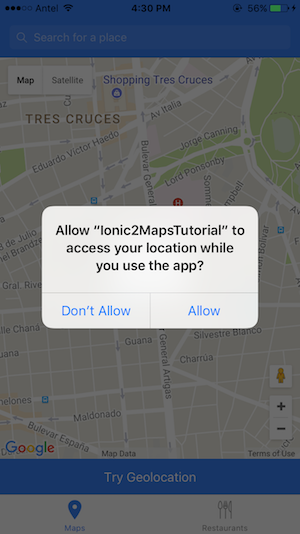 If you are working with Ionic 1 check Add Google Maps, Places, and Geolocation to an Ionic App. We merged three of the most common cases around location based apps Maps, Geolocation and Places into one functional and coherent/comprehensive ionic app. Google Maps and ionic mobile apps are a perfect match. By itself, the Google Maps API is an amazing piece of tech, but when you combine it with a device that’s meant to be mobile, it opens up an array of possibilities. There’s a ton of awesome apps out there that uses Google Maps to do all kinds of marvelous things. Even when you’re making an app that doesn’t have maps as the core functionality, it can often be quite useful as a supplementary feature as well (by displaying the location of your business on a map, for example). 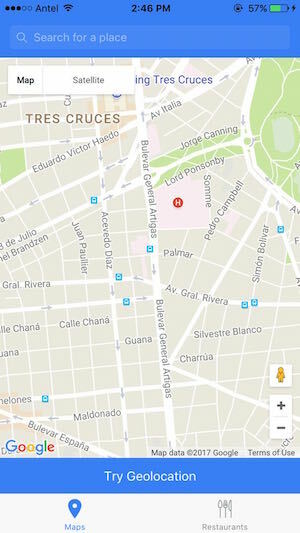 We will use the popular Google Maps API to display and interact with maps. 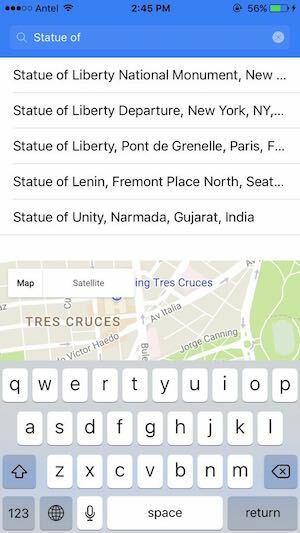 There’s a ton of things you can do with the maps API and we will cover some of them in this ionic tutorial. We will explore how to apply place recommendations and suggestions using Google Places API, with its up-to-date information about millions of locations. Combining all these functionalities, we’ll be building an app where you will be able to search for places using Google autocomplete and place suggestions, and then use the nearby search endpoint to find restaurants around your desired location. If you are looking for a more complete example you should check Ion2FullApp ELITE. You need to get an API key to be able to make requests to the Google Maps API. Once you have your KEY you should add the following script into your index.html. Step 1: Show me a map! Let’s start with the basics. We are going to initialize the map in a random place, using latitude and longitude coordinates, and setting a defoult zoom. 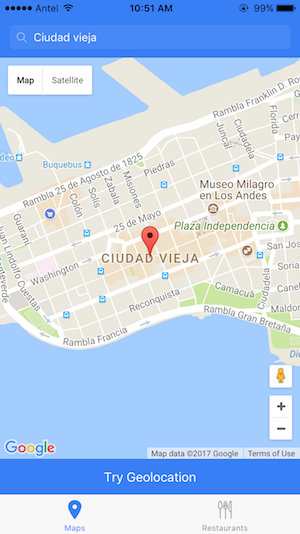 To display a map we just add the following div in our html view. Then in the component we initialize the map in our preferred coordinates. Setting the map full width and height, while removing some controls from the map, makes it look much more clean and simple. So, with these few lines of code we are able to display a map in a static location. Let’s dig deeper, and add Google Places searching and autocomplete functionalities. With the following code are going to add a search bar where user can start typing a place and we will show him with the Google search recomendations. The updateSearchResults() method is triggered everytime the user types something on the searchbar. We will use a list for the autocomplete suggestions which we named: autocompleteItems, an input which will be the input typed by the user, which we named: autocomplete and an instance of the GoogleAutocomplete service. As mentioned before, everytime the searchbar input is updated we will trigger updateSearchResults() method. In this method we will make a request to Google Autocomplete service and ask for Places predictions based on the input typed. In step 2 we learned how to search for a place, but what happens when we select one? The code belows shows how to center the map and show a pin or marker on the selected place. As we can see, when we click in a result from the autocomplete list we trigger selectSearchResult(item) method. Please note that we have initialized the geocoder and the markers list in the contructor. 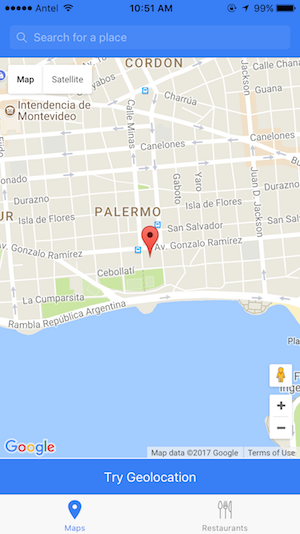 The Geocoder is an item from the google maps library that let us search by place id and markers list contains the information of the marked (or pinned) places. In order to access the user current location we are going to use Geolocation Crodova Plugin. You need to install it, as explained in the Set Up section. Once installed we call getCurrentPosition() method to get the latitude and longitude of our position, and then we create a simple pin/marker and move the camera there. 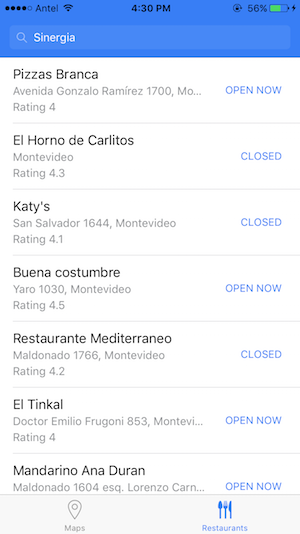 To go the extra mile in this tutorial we added another tab with Nearby Restaurants, this means that when the user selects a place in the autocomple list, instead of showing him a map with a pin, we will show a list of the restaurants in a radius of 500 meters. For this example we only list nearby restaurants but there are lots of different places 'types'. Click here to learn more about Nearby Search Places. Please note that YOUR_KEY_HERE is you Google API key. If you are looking for a more complete and UI/UX polished example you should check Ion2FullApp PRO which includes a complete example about maps. 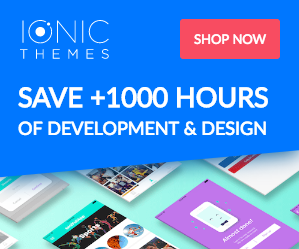 Did you know we also sell beautiful ionic templates and components which you may find super useful because they save you hours of development, time and effort, while giving your projects a great design from scratch?